I’ve also heard great things about these fisherman sandals. They are very affordable and come in a bunch of different neutral colors. And the Born Mai is a similar style with a comfortable footbed. The next thing to consider is the type of bag you’ll need. You want to be prepared for anything — a random rain shower, an errant spray of ketchup, a leaky toddler . . . so you need a bag that can accommodate all your gear. If you are traveling with kids and need a larger bag, consider a lightweight backpack so you can carry everything you need and remain hands-free. I recommend looking at Baggallini or Tumi for bags with a lot of pockets and organization that are also stylish. Bric’s X-Travel City Backpack is a good choice for a backpack under $100. The Tumi Canton Crossbody is the gold standard. The front zippered pocket and back pouch are perfect for holding smaller items such as receipts, passports, boarding passes, etc. The main compartment is perfect for larger items such as sunglasses and your wallet, and the roomy interior features numerous organizer pockets so your stuff is neatly stored and easy to find. Baggallini also makes a ton of cute styles for more affordable prices. I particularly like the Criss Cross. There is a spot for everything in this clever organizer. No matter what type of bag you carry, you probably want to go for a lightweight nylon rather than a heavy leather bag. It won’t get ruined if it gets wet, and it’s much lighter to carry around all day. That said, I like to live dangerously (haha!) so my current bag of choice for travel is this Hobo Cassie crossbody. I carried it all over Disney during my last trip, and it worked out great. It’s lightweight for a leather bag, and it has great organizational features. I’ve always been a fan Hobo’s glazed leather; it’s pretty and very durable. The last thing to plan is your clothing. I have always traveled to Disney in fall or spring. I’ve never been there in the dead of summer when it’s stifling hot, so most of my outfit ideas are geared for the fall/winter/spring seasons when the weather is milder. If you’re traveling in the summer months, take these ideas and apply them to summer clothing. In the winter months, layering is your friend. I love jeans and denim shorts and find them quite comfortable, so most of my go-to outfits features denim. If you’re there during cooler weather, you will want to make sure to have a hoodie in your bag. A nylon backpack is perfect for moms with young kids who need to cart along some extra gear, and comfort sandals or sneakers are a must. Here’s an example of an easy outfit that is perfect for the theme park. Cotton shorts work well too, and they lighter than denim if you’re visiting during the warmer months. They also dry faster if you get wet on a water ride. If you don’t need to carry a large bag, go for a lightweight crossbody. Lightweight cotton tees are always a safe bet for the theme parks. Also consider a fun graphic tee for something with a little more personality. See some of my casual shorts outfits for more inspiration, but you will probably need to swap out the shoes for something more suitable for walking. A casual dress is another great option for the theme parks. Some women find dresses more comfortable than shorts, and it’s certainly a cute look — especially if you’re going out to dinner. Go for a nice lightweight cotton or a moisture-wicking fabric. Athleta always has a nice selection of casual dresses, and you can also find some cute ones at Old Navy. I recommend the Jockey skimmies slipshorts for wearing under a dress to keep you comfortable. And there’s nothing wrong with wearing cute athletic wear at an amusement park these days. Athleisure is now a thing, so go for it! I like to accessorize when I’m wearing athletic wear for daily activities so it looks intentional and not like I’m just being lazy. I usually throw on my favorite pendant necklace and Alex and Ani bangles, and I’m good to go! 1. Keep it casual, but put some thought into it. Leave the designer duds at home and go for a casual skirt, shorts or jeans. Top it with a favorite tee and bring along a hoodie or casual cardigan in case it gets chilly. Lightweight pieces are best because you will probably be sweaty, and you might get wet on an occasional water ride. For cooler weather, definitely pack jeans and a few long-sleeved tops or sweaters. Layers are your friends! 2. Bring shoes that are comfortable; change often. There are tons of choices for shoes other than sneakers that give your feet the necessary protection and support. That said, athletic sneakers are trending right now for street wear, so if that’s your thing, go for it. 3. Dress in layers, depending on the weather. Always bring a sweatshirt or cardigan (evenings are often chilly, plus sometimes the indoor rides are cold and dank). And a lightweight rain poncho is always a good idea for those surprise rainstorms. 4. Bring a lightweight bag that is large enough for your gear. I like a nylon crossbody bag because it keeps my hands free and isn’t too heavy. If you have kids with you, you may need something bigger. There are lots of stylish backpacks out there. 5. Don’t forget your sunscreen! I highly recommend this 4-piece set from Coola. It comes in a handy little bag that is perfect for travel. Now that you’re all set with what to wear to Disney World, it’s time to pack! 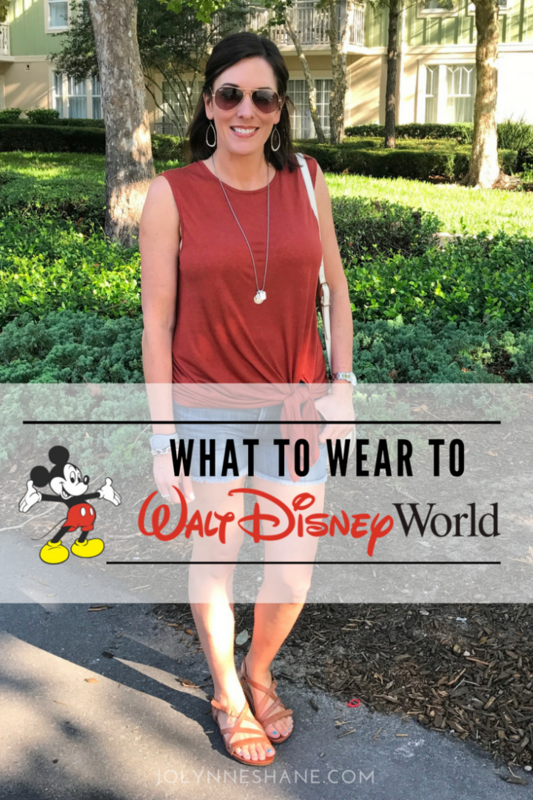 Check out my post on what I packed for my last Disney vacation along with the outfits I wore while I was there. I’d be honored if you would PIN IT to Pinterest so others can find it. Thank you! What r the fashionable type of socks to wear with sneakers for sightseeing etc or is sockless the way to go? I feel like a need something between my feet and sneakers for heavy duty walking days. Hi, Loraine, I would recommend to you, to opt for a pair of either nike frees or adidas gazelle. Both are designed to wear without socks, and feel great from the inside. Besides that you would look more stylish and chic for not wearing socks. I believe that Jolynn agrees with this since she never wears socks with casual sneakers. What do you think about this Jolynn? Bdy, its been a while that you posted something casual with shorts, or jeans and sneakers. Maybe you can try nike frees this time. I own a pair and sometimes need to have some advices how best to pair them. I’m so sorry that I never answered your question, Lorraine, I don’t know how I missed it. Whether or not I wear socks depends on the shoe, and how much walking I’ll be doing. When I wear socks with fashion sneakers like Converse, I wear these: http://rstyle.me/n/bymh5ngthw. If I wear a heavier athletic shoe, like the Nike Free or Adidas styles, I just wear a super low sock that match the shoe as closely as possible — usually grey or white. My favorites are these: http://amzn.to/2EZwwie. Great advice, thank you. I was wondering if you have a link to the black sandals with the embellishments on them that you are wearing with the t-shirt and jean shorts? I love those! What a smart thought to change your shoes mid day—i would have never thought of that Jo-Lynne! What made you think to do that? And your point is spot on—sure, it doesn’t really matter what you wear, but there will be pictures, and you want to look back on them with pride & good memories!! I’m headed to Germany in a couple weeks with 15 business school students. Will be adopting and adapting many of these ideas! Thank you. I have the Vionic sandals! They are very stylish, have fantastic arch support, and are worth the money if you have finicky feet/ankles. My husband uses a man purse/fanny pack every day! He doesn’t wear it around his waist, thank goodness, but I can’t break him from using it. Any suggestions on how I might be successful? Thanks! The only advantage to the one he is using now has a place to carry a pistol, since both of us are licensed to carry. Thank you so much for showing me the error in my ways. UFFDA!!! Have I been wearing the wrong clothes!!! Sad thing as I have decent clothes that would work, just didn’t think of putting together! Who would of thought to change your shoes!! My feet also thank you!! Perfect timing!!! Again, thanks for the great advice & outfit ideas!!?! LOL!!! I am sure I way over-think it, but I’ve been quite a few times, so I finally figured out how to be comfy and cute, and it’s so much less stressful when you know what you’re going to wear and you feel good all day. I love the length of the denim shorts you’re wearing on this post; a little bit longer, which my legs really need…:) The link to shorts only showed really short ones (the days of short shorts has passed for me). Do you have a link to the jean shorts you’re wearing? Just got back from Disney a few days ago. Whenever I stressed about how I looked my 23 year old said to me ‘ it doesn’t matter what you are wearing as long as you look happy no one sees the clothes’ . Showing friends our pictures all anyone said was how happy we both looked. Disney is a place you can be a kid again and there is nothing better than seeing everyone rocking their mouse gear with grins on their faces. That’s what it’s all about. Where did you buy the cuffed jean shorts from, love the longer length? I’m going on a cruise in July. Not the best time to go to the caribbean but it’s an extended family trip and that’s what the family chose. Last time I went on a cruise I brought way too many pairs of shoes yet I wore the same pair of Merrell sandals the entire time. Lesson learned. I’m focusing on breathable cotton fabrics and I bought 2 very good quality swimsuits including swim shorts I can wear around. I’ve been looking at Loft clothing recently and while it’s very pretty, there are a lot of linen and clothes that look like it has nonbreathable fabric. I love your choices and will be accessorizing a lot to make things interesting. Breathable fabric is key, and accessories really do make all the difference. Have so much fun on your cruise! Question- what do you suggest for sweatshirts in chilly weather? My last photo in my favorite but baggy sweatshirt looked awful! I think I need to make room for some fitted tees. My first trip to Disney I wore overalls (because they were comfy?)!!! Can’t believe those pictures now Lol! So happy to help! Have fun! Great post, even though we won’t be going to Disney World or on a vacation of any kind. You presented so many options for shoes, purses, etc., and reminded us how a few accessories can jazz up even the most casual outfit. We were in the low 80’s yesterday and will be again today, so it feels like we’re in FL. Have a great day! I would love to see a post similar to this but for traveling to Europe. How to pack light (carry on only) for traveling overseas but still look stylish. Thanks! Check out https://www.travelfashiongirl.com/ ! I travel frequently out of the country and she has a packing list for almost EVERY country in EVERY season that I find very helpful. Great update to this post, Jolynne! So many options to be comfortable and look pulled together at the same time! Two summers ago, we went to Universal Studios in Orlando. Even in early June, it was quite hot. I wore a lot of my athleasure tops with sporty shorts- the polyester technical fabrics really helped keep me cool and looked nice in pictures as well. Leave the long necklaces and bracelets in the hotel! If your going on the rides they will tangle in the safety harnesses and belts. You will love them. I wore them all over Disney for two days and didn’t even break them in first. (Not that I recommend wearing shoes that aren’t broken in, it’s just the way it worked out.) They’re awesome. I’m not going to Disney but love seeing the sandles & handbags. Always looking for cute comfy sandles. I did the Disney thing when my daughter was much younger but we went back when she turned twenty because she’s a big Harry Potter fan and needed to go diagon alley. Lol. But I enjoyed it too! Boy I would have loved this post for that trip. My feet almost didn’t hold up 😟 so I highly recommend a good quality shoe. You’ve done a great job here, But I’m not surprised…as I’ve come to recognize all the effort you put into all your posts. Thank you and have a great day! What a great post! My days of taking the little ones to Disney is over, but everything you posted is so relevant to weekend day trips. You gave me a lot to think about. I probably have a lot of these items and need a few things for the complete look. Thank you!!! Super helpful post! Does Disney or Universal Studios have any prohibition on the size of a bag you can bring into the park? I’ve been to concerts where they’re very picky about the size of the bag. Even a small crossbody is sometimes not allowed. Also, what about rules regarding bringing bags on rides? When I went to Busch Gardens in Williamsburg last year, they did not want you bringing any bags, even tiny crossbody bags, on rides, especially roller coasters. Thanks! I’ve never had any issue at Disney. I’ve seen moms come in with big backpacks and diaper bags. Amazing, I am reading your post in a car on Route 95 on my way to…Disney World! Should arrive Saturday morning. Loved all your fashion suggestions agreeing that the most important items are footwear (love your suggestion of switching shoes part way through the day). I will be trying to keep up with three grands, ages 9, 7, and 4. I did pack several Lularoe Disney tees with adorable Mickey/Minnie prints and one pair of the softest Winnie the Pooh leggings that will thrill the 4-year-old! Thank you for the very timely post!!!! Have so much fun at Disney! These are all great tips! I think changing shoes mid day is very helpful. I don’t like to go without socks when doing a lot of walking, but I do try to go with “no show” socks. I like to change my socks out during the day, even if I’m not able to change shoes. The outfits you’ve shown are so helpful too. These are just another example of why we love you, JoLynne…nothing over the top (too showy), modesty always, but cute, current, and put together. I think any bag can weigh you down after a day of walking. That’s why I suggest nylon ones – they’re usually lighter than leather. I just got done watching your Facebook live on my cell phone. 🙂 I’m the one without Facebook and I can still watch it on my cell. 🙂 Its fun to see you talk and your personality. It was also fun for you to address me and my question I had for you from email. 🙂 It helped for you to try on the moto jacket upclose and talk about if it hung wide or not, since the zipper was off set to the side. It looks really good on you. Thanks for answering my question. 🙂 I have 2 more questions. Where do you subscribe to your newsletter you were talking about? And, I just read your blog today and was wondering if you could elaborate more on the sunscreen you recommended. I have never heard of Supergoop. Sunscreen is so hard these days with all the bad chemicals and new recommendations. I’m still confused what chemicals to avoid etc. etc. We still have snow in the NW. Our schools have been closed all week, which is strange for us. I guess since I know our Spring rains are to come, I’m going to enjoy the beauty of the snow. I think there is one more chance of it snowing again tomorrow and then we are suppose to be out of it. I think lows tonight is suppose to be 20, so all this will freeze on the roads. 🙁 I don’t like the ice. I am tired of feeling house bound though. Great post Jolynne! I think you make an excellent point about how much difference accessories make when we’re wearing athleisure or casual clothes. It truly makes the difference between looking intentional and sloppy! I would add– if you’re wearing athleisure, make sure to style your hair cute (even if it’s just a cute ponytail/braid/etc as opposed to a sloppy bun) and to do your makeup! For me that’s the key in whether my athleisure looks cute or like I just rolled out of bed! What is your opinion on Birkenstocks as a casual summer sandal? They have never really been my style, but I have seen several women on Instagram styling them and they look cute. Do you own a pair and if so, are they comfortable to walk in and do you think they are worth the investment? Thanks! Hey Melissa. I like them on other people but can’t ever seem to get excited about them on me. I have thin, flat feet and chicken legs, and they sort of overwhelm me. 🙂 I do think they’re fun, though, and very comfy, if they’re your thing. Definitely still trending. Can you do a post on what to wear to visit Israel, Palestine and Jordan? I am going in October and I am having trouble finding examples of clothing that are stylish but not frumpy or too boho/hippish. Thank you! The Walt Disney World post you had was how I first found your blog! I think that your style of casual but still put together was perfect for the parks! One thing I always recommend regarding footwear is to consider the weight. I like to wear fabric sneakers (like running shoes) because walking around in soaking wet leather shoes is no fun! (My kids LOVE the water rides.) We always change shoes at least once a day when at the parks – between sandals, sneakers, etc. I did learn a few years ago that bringing moleskin really helps in case a pair of shoes gives you a sore spot or blister! Hi, I am nervous about getting blisters. Did you wear your converse shoes with no show socks or barefoot? I’ve worn them both ways, but for all the walking I do at Disney, definitely no show socks. Thanks a lot. Heading to Disney without kids is a little odd for me. For some reason just focusing on myself has been a real mind bender. You have backed up my ensemble choice. Not that it matters but we all know those photos last forever and I don’t want to look like an old “Mom”. I hear ya! 🙂 Have fun! Hi – Thank you for this post. I’m definitely grabbing one of those pairs of sandals you talk about in your post. I love the ones you wore in the first picture. A bit pricey for me though. May I ask what brand your top is? The shirt with the tie at the waist is perfect!!! I can’t seem to find them online..
Hi Brandi, it’s from last year, unfortunately. I believe it was the trouve brand from Nordstrom. This post was perfect. Your looks, your links, your advice- I’ve been scanning for weeks and you finally nailed it. Your outfits are adorbs and your links are so perfect. Thanks, Sara, so glad it’s helpful!